August 4, 1936: An MGM inter-corporate memo was drawn on this date, loaning Judy to 20th Century-Fox for their production of Pigskin Parade” It was Judy’s feature film debut and was the only time MGM loaned her out to another studio. 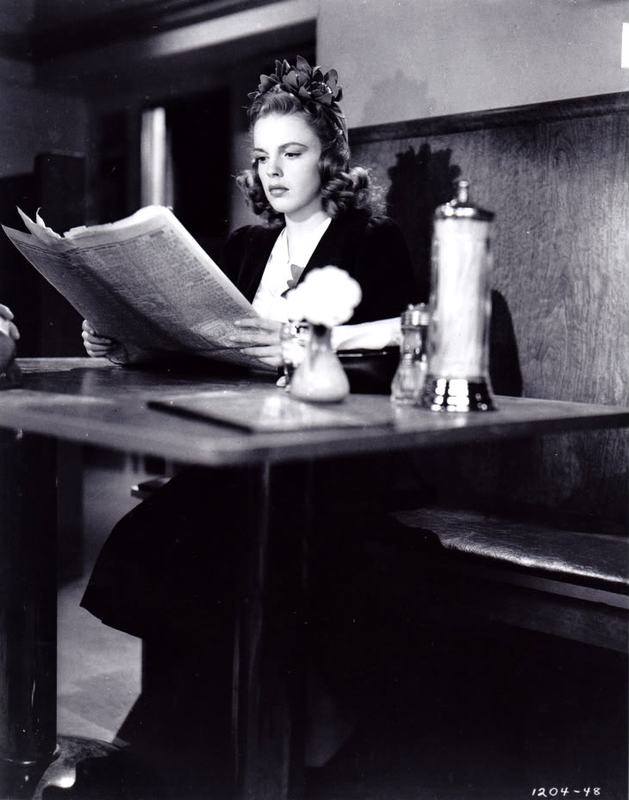 August 4, 1938: Judy Garland, movie jitterbug named her screen favorites in swing-slang today. 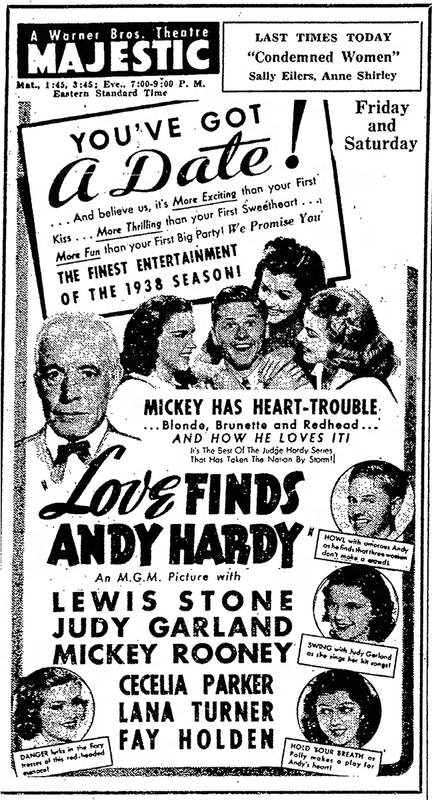 Also on August 4, 1938: More ads promoting Love Finds Andy Hardy. 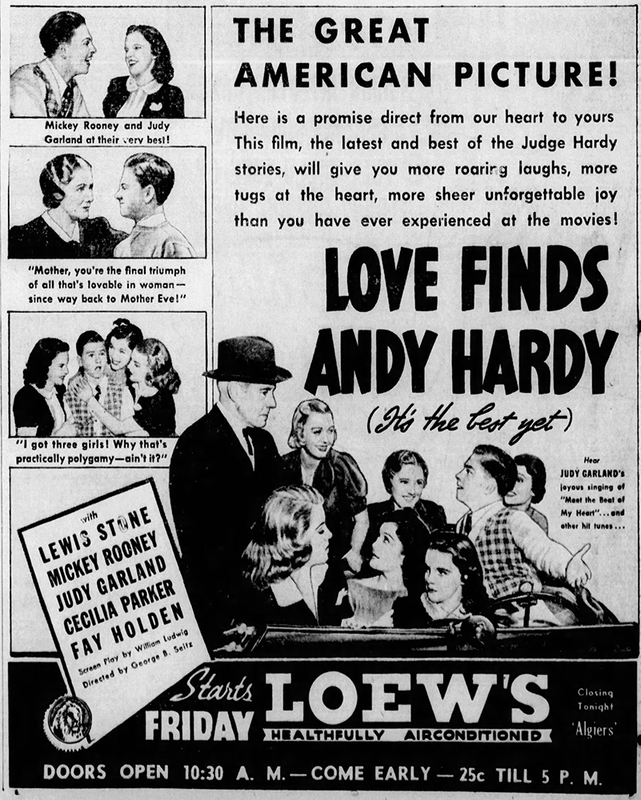 Check out The Judy Room’s Filmography Pages on Love Finds Andy Hardy here. August 4, 1941: Filming continued on Babes on Broadway specifically on the “Interior Pitt-Astor” and “Exterior Pitt-Astor” sets. Time called: 2 p.m.; time dismissed: 4:30 p.m. Photos provided by Kim Lundgreen. Thanks, Kim! 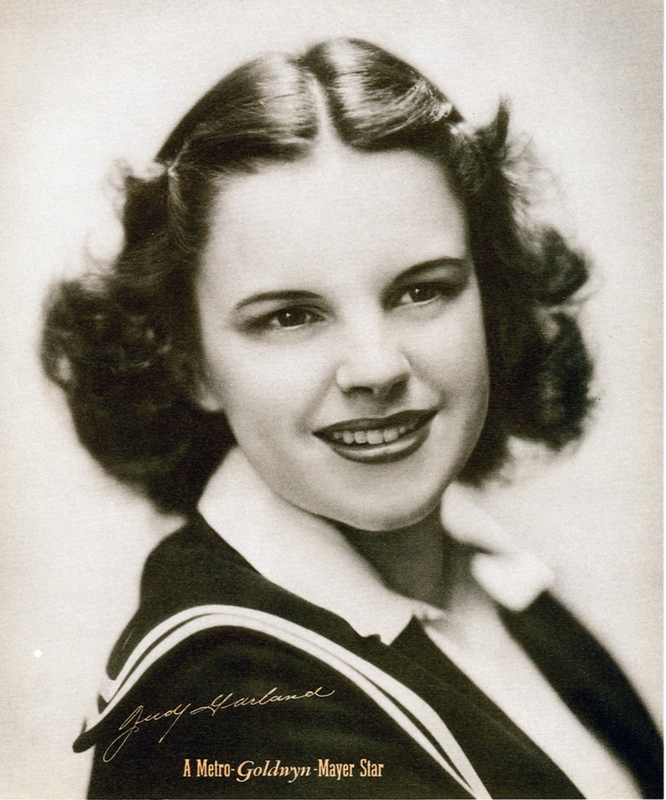 August 4, 1944: Judy was ill and did not work on The Clock, currently in production. The assistant director’s notes state: JG reported sick: Miss Garland phoned Glazer last night after dinner that she was feeling a little ill and didn’t think she’d be able to work today. Glazer phoned her mother’s house before nine this morning and learned Miss Garland has spent a restless night with a temperature of 101, and they were waiting for a doctor to call. Company went ahead and made shots with [co-star] Robert Walker as planned. 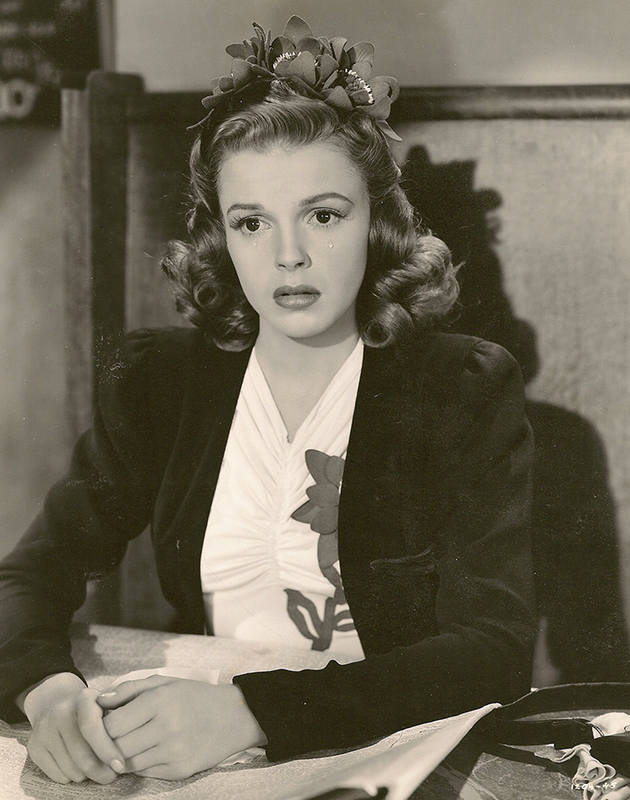 Check out The Judy Room’s Filmography Pages on The Clock here. 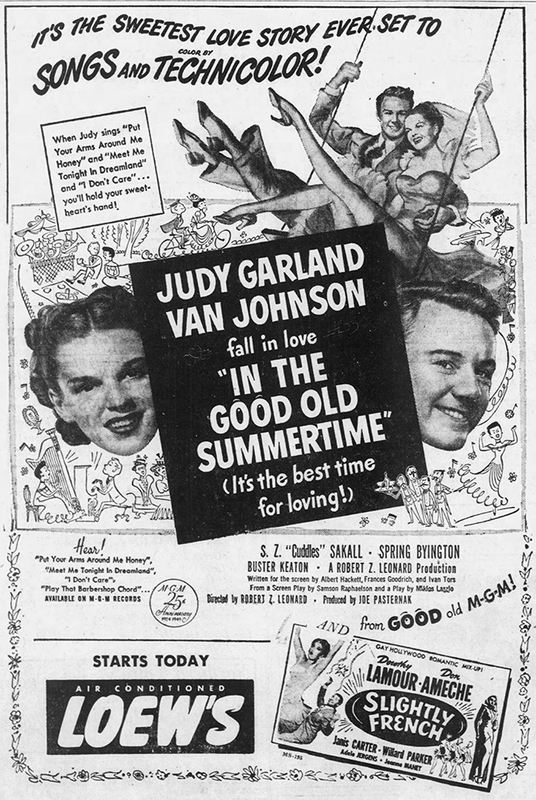 August 4, 1949: In The Good Old Summertime opened on this day at New York’s Radio City Music Hall. 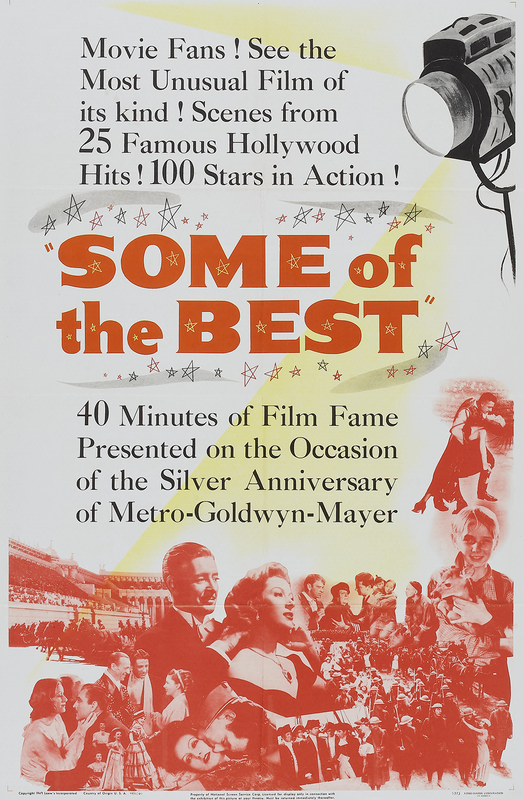 Accompanying In The Good Old Summertime in some theaters was MGM’s 25th anniversary short, Some of the Best, which ran a solid 40 minutes and featured clips from MGM’s films over the past 25 years including The Wizard of Oz, Easter Parade, and In The Good Old Summertime. 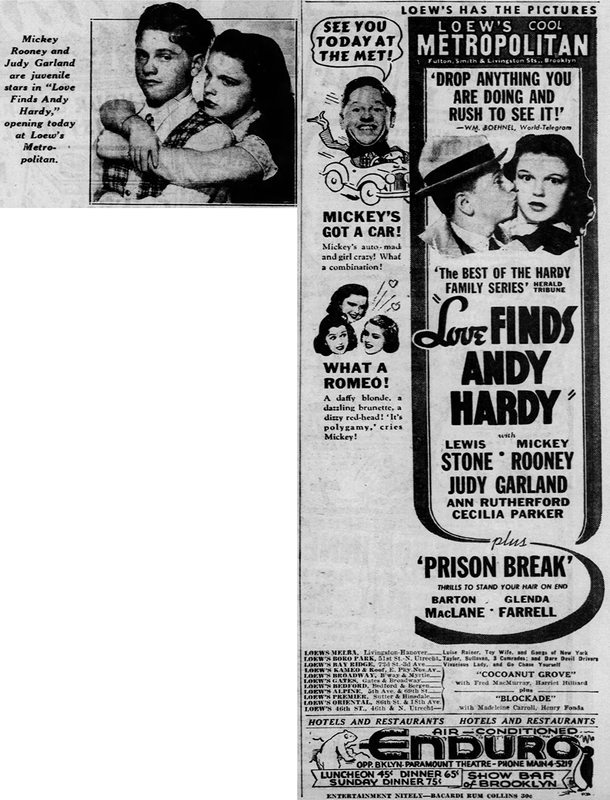 Check out The Judy Room’s Shorts Pages for more about shorts that Judy was featured in. 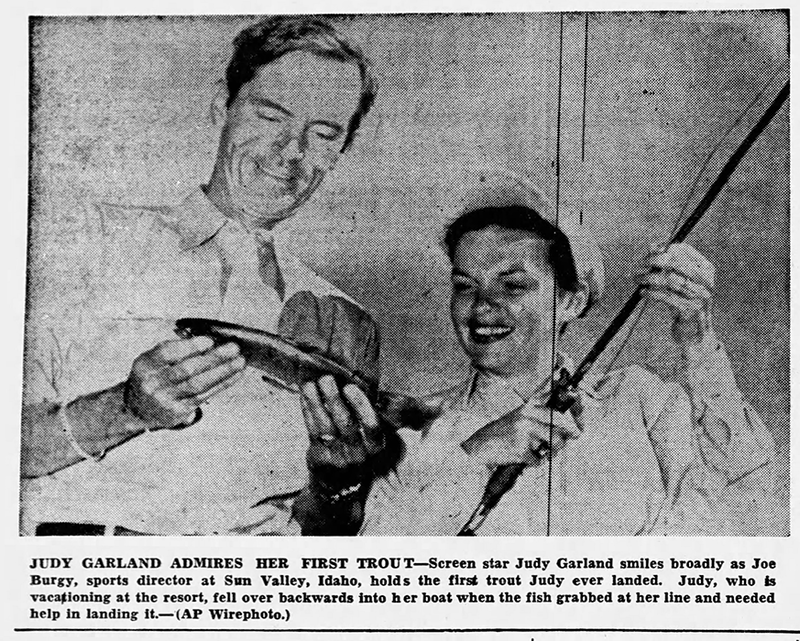 August 4, 1950: More coverage of Judy in Idaho. Judy was enjoying some much-needed rest and relaxation Sun Valley. 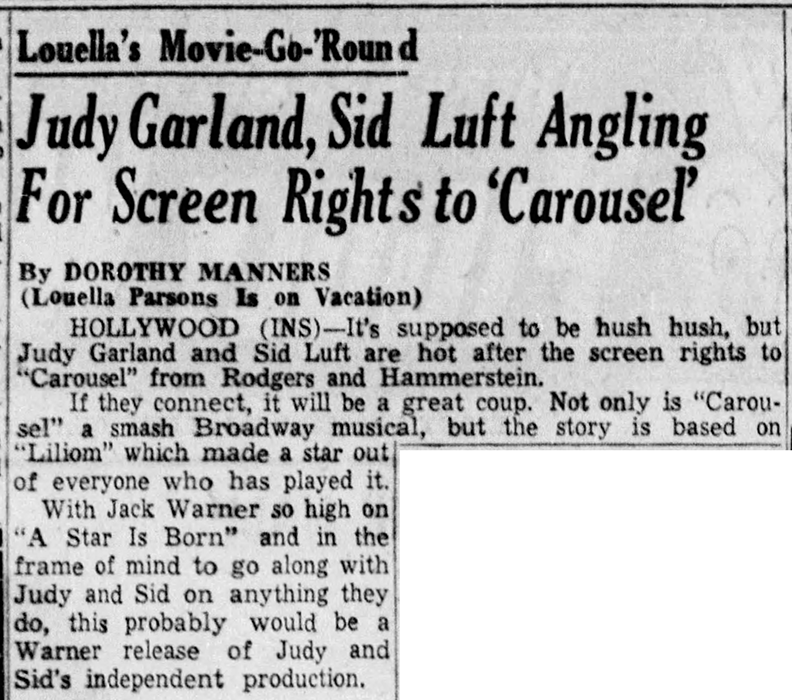 August 4, 1954: Dorothy Manners, subbing for Louella Parsons, reported that Judy and husband Sid Luft were thinking of producing a film version of the Rodgers & Hammerstein Broadway hit “Carousel.” The project never happened and the film was eventually made with Shirley Jones and Gordon MacRae in the lead roles. Judy recorded “You’ll Never Walk Alone” which was the breakout ballad from the show, for both Decca Records (recorded on July 10, 1945) and for Capitol Records (August 3, 1960). Although they were recorded 15 years apart the arrangements for both are almost identical. 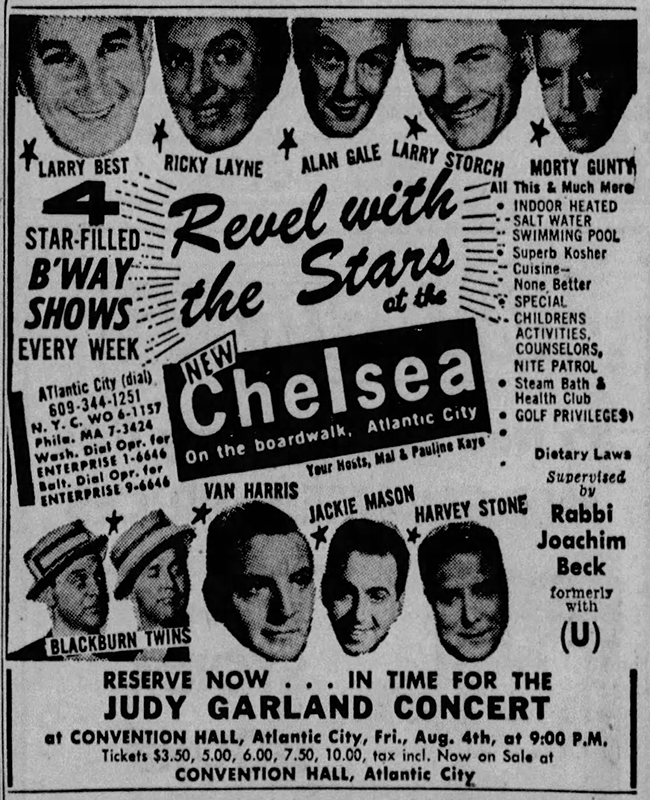 August 4, 1955: Photos from Judy’s show in Long Beach, California, on July 11th, attended by an incredibly star-studded audience, were still being circulated. 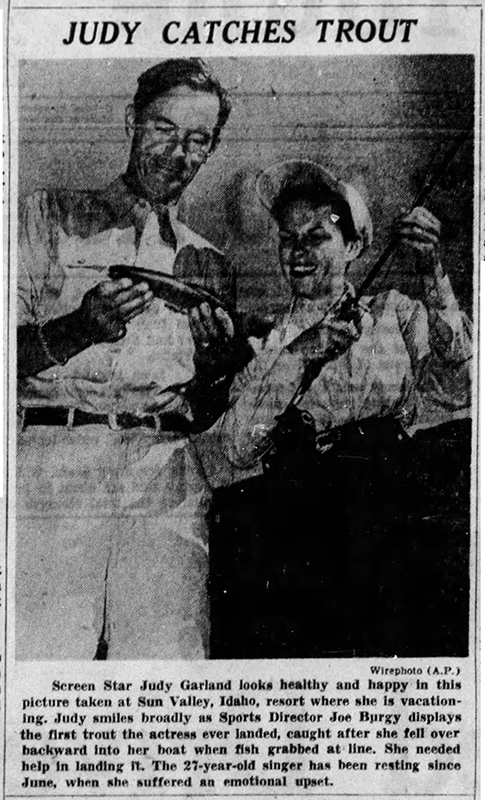 August 4, 1957: In his audio column, Stewart N. Doss reported on a Garland fan named Blayne Salyer and what kind of equipment he used to listen to his favorite singer. 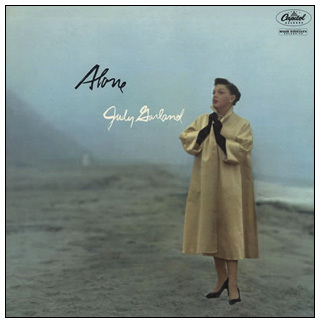 Salyer was probably enjoying Judy’s latest album, “Alone,” which was released that previous May 6th. 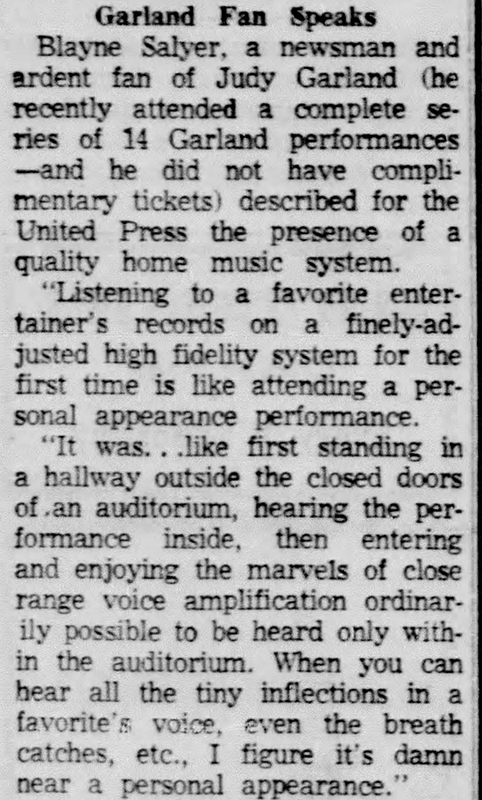 Blayne Salyer, a newsman and ardent fan of Judy Garland (he recently attended a complete series of 14 Garland performances – and he did not have complimentary tickets) described for the United Press the presence of a quality home music system. 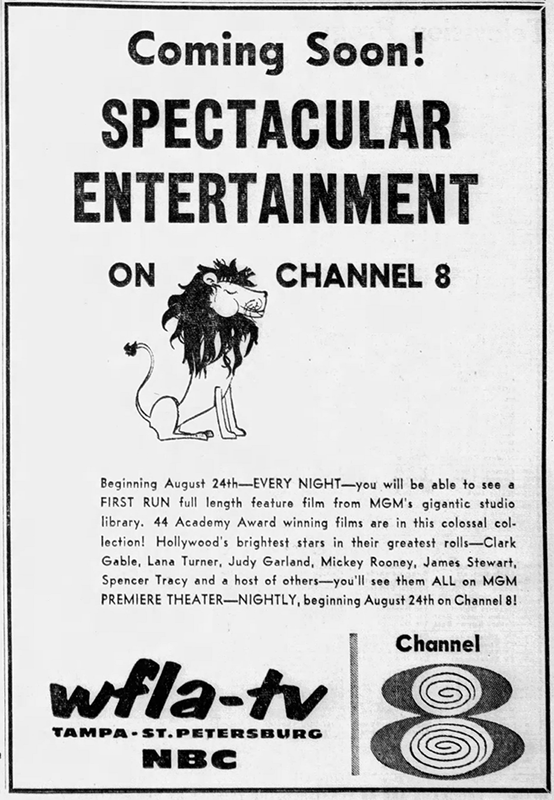 August 4, 1957, & 1959: Two ads promoting MGM films on television. 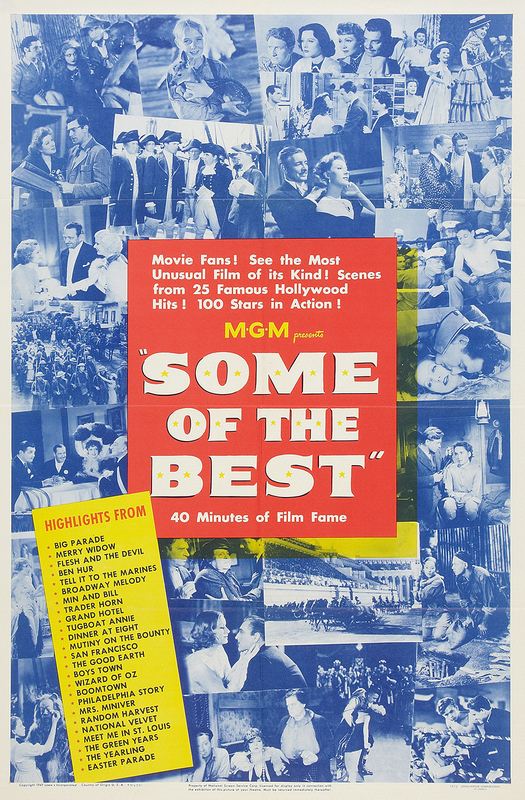 In the late 1950s, MGM leased most of its backlog of classic films to television. The most famous, of course, was the leasing of The Wizard of Oz in 1956. The sessions, known now as “The London Sessions” were intended to result in a two-record set of new Garland recordings in stereo. Judy’s in amazing voice. Most of the recordings stayed in the vaults due to “Judy at Carnegie Hall” being such a huge success in 1961. The label didn’t think an album that contained most of the same songs (although they were studio versions and not live) would not sell well or it might impede on the sales of the Carnegie album. All of the recordings were released in 1972 on a special set released by the Capitol Record Club to members only, titled “Judy in London” which was re-released in 1980 on a Capitol Records “Special Markets” release. 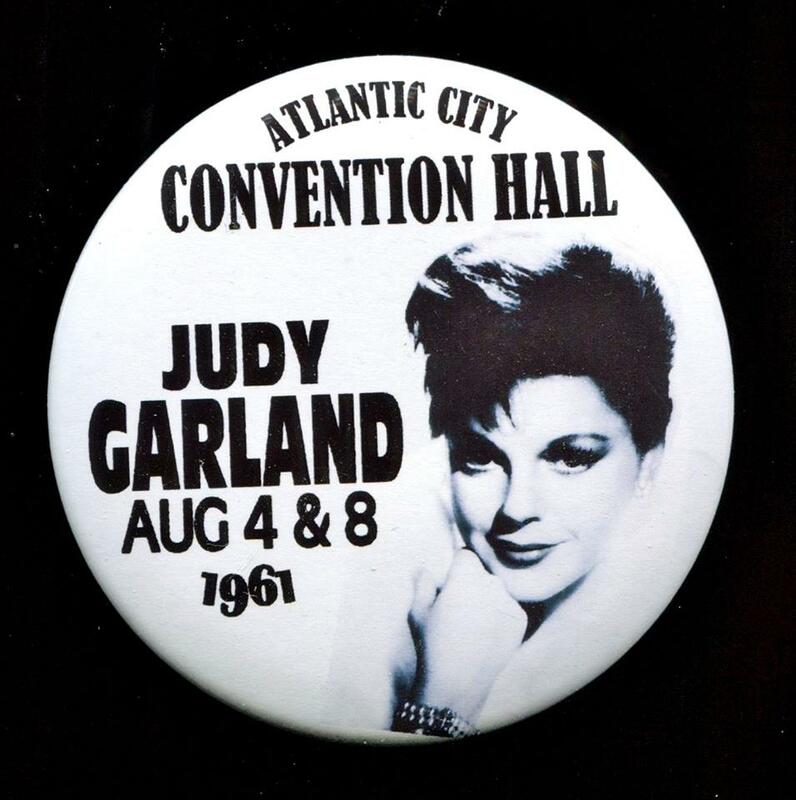 August 4, 1961: Judy took her show to the Convention Hall Ballroom at Atlantic City, New Jersey. She stayed at the Claridge Hotel. Judy returned for a second concert on August 8th. 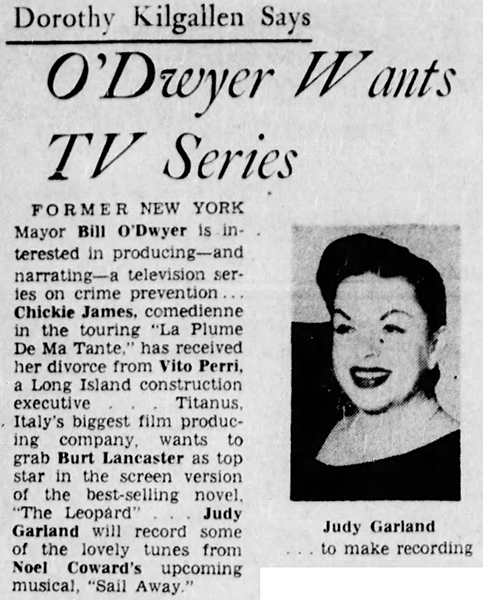 Also on August 4, 1961: A few clippings. 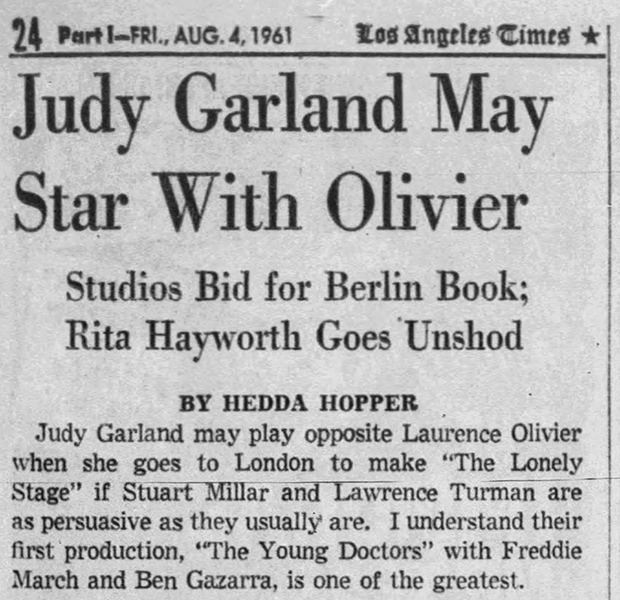 According to Hedda Hooper, Laurence Olivier was in the running to co-star with Judy in The Lonely Stage (retitled I Could Go On Singing). The pairing with Olivier would have been fascinating. Dirk Bogarde got the role. 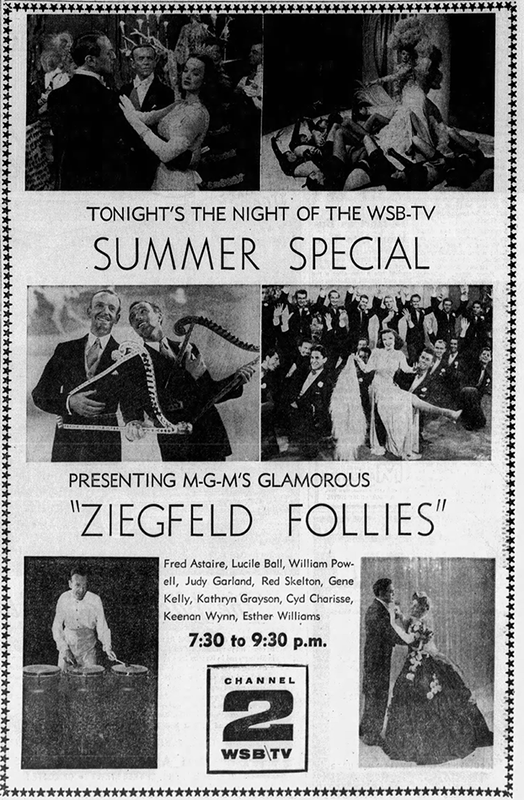 Dorothy Kilgallen reported that Judy was set to record songs from Noel Coward’s Broadway show, “Sail Away.” Judy never recorded the songs in the studio but she did perform the title song on April 26, 1962, during her “Manhattan Center” recording session as well as on “Episode 25” of her series, taped on March 6, 1964. and aired on March 22, 1964. 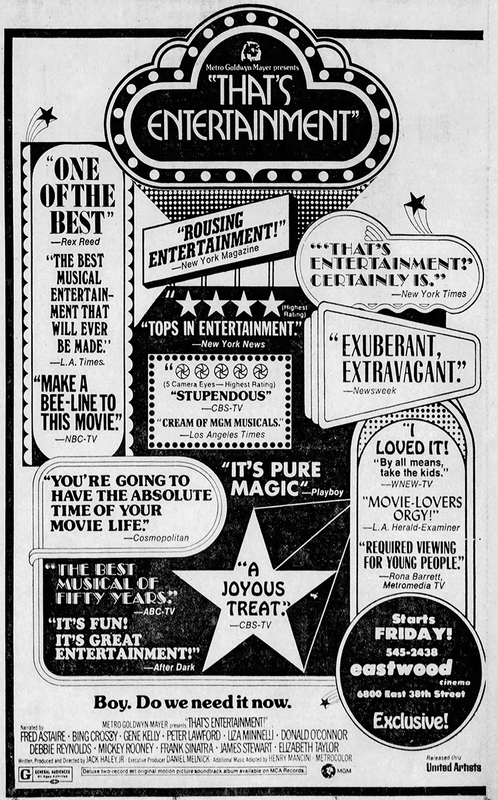 August 4, 1966: Here’s an example of the typical ads that ran promoting records stores of the day. Those of us of a certain age remember the joy of scouring records stores looking for any Judy Garland record we could find. Here, “Judy Garland & Liza Minnelli ‘Live’ at the London Palladium” was on sale. 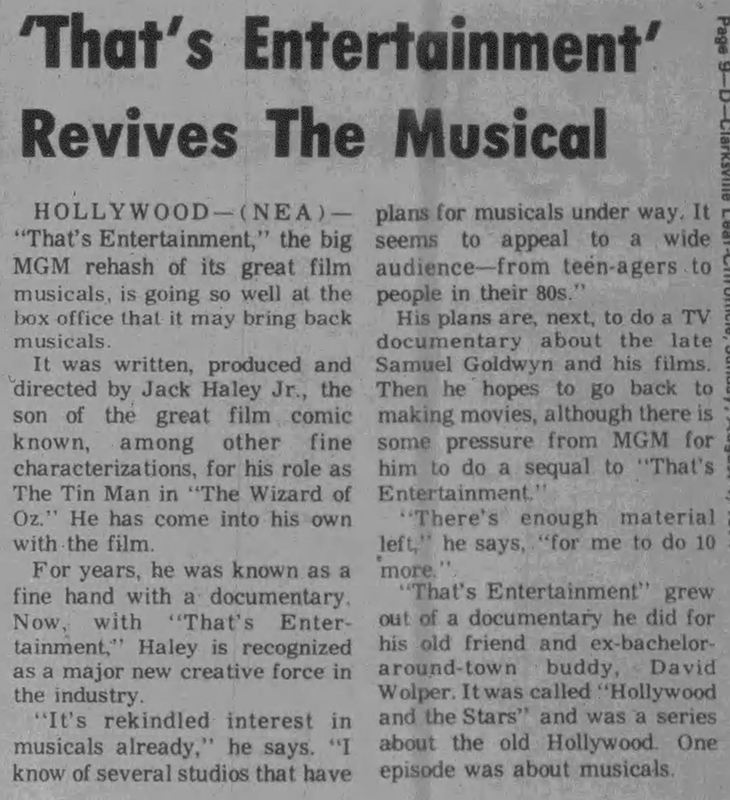 August 4, 1974: That’s Entertainment! 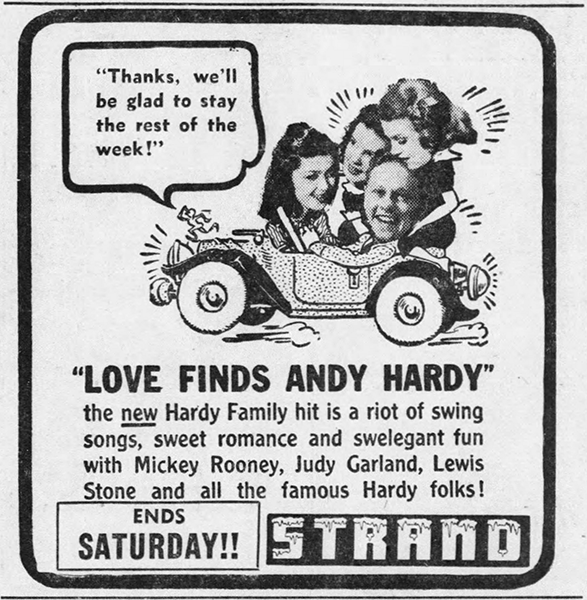 was the surprise hit of the summer of 1974. 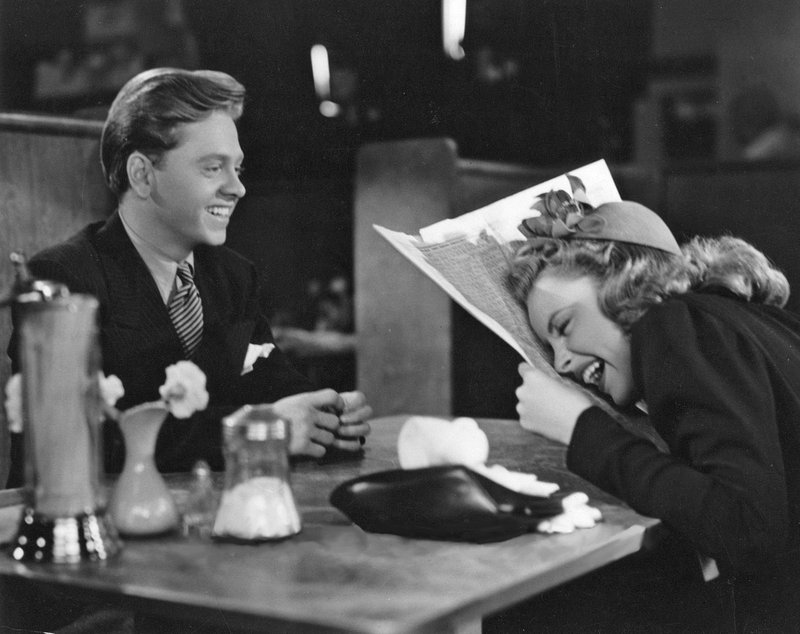 The film did wonders for Judy’s legacy by introducing her great body of work at MGM to a new generation of filmgoers and film buffs. Almost 20 years later, on August 4, 1993, came the news that a third installment in the series was being made, this time including quite a few previously unseen outtakes. August 4, 1989: The 50th anniversary of The Wizard of Oz was in full swing. Roger Fristoe reported on the upcoming release of a special edition of the film on VHS and laserdisc. 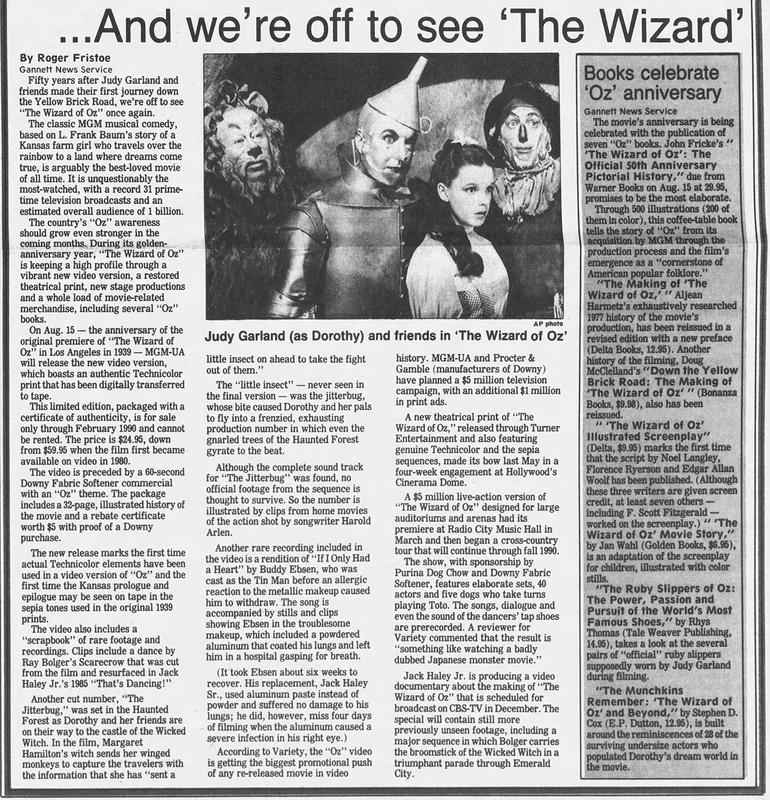 Check out The Judy Room’s Extensive Spotlight on The Wizard of Oz here.